This eMeals recipe is a snack that my kids will absolutely love. We often have a snack of pretzel sticks dipped in Nutella, because I love the taste of a sweet and salty mix! 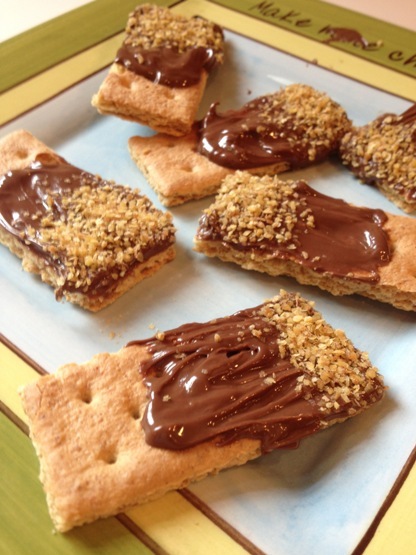 In this quick and easy snack idea from eMeals, they’ve paired Nutella (or any store brand version of a chocolate and hazelnut spread) with graham crackers and added a dusting of wheat germ. When you serve this with an icy cold glass of milk, you’ll add extra calcium for those growing bones! Dip graham crackers in Nutella (about halfway up). Dust with a sprinkle of wheat germ. Find recipes for making your own Homemade Nutella HERE. Hmmmm! great! I always like snack. And thanks for your Instructions.